PK: Mitzi, please introduce yourself to us. MP: I’m a businesswoman, speaker, writer, family person, the widow of Frank Perdue, and the daughter of the founder of the Sheraton Hotel chain, Ernest Henderson. MP: I grew up with a lifetime fascination with success. I loved asking my father what helped make Sheraton grow and what his theories were on such things as management, bargaining, and getting ideas. PK: And what were those theories? MP: He had an abundance of theories, but one of them was, he was a believer in persistence. He felt that he’d try a 100 leads where his competitors might get discouraged at 40. He also felt that in bargaining, it was an excellent idea to leave something on the table. By this, he meant, “Be generous.” He said that the Sheraton Hotel chain grew in part because when someone’s hotel would come up for sale, it would often be offered to Sheraton first and he’d get the pick of the best. That’s because sellers knew Father’s reputation for treating people fairly and generously. I’ll never forget his answer. “The subject was an important one, and if you can get one good idea, wherever you find it, it can change your life.” He felt that having access to good ideas gave him a leg up on his competition. When I’m giving talks on success, one of my first tips is: take classes, read books and journals, attend lectures, and go to conventions…put yourself unendingly in the way of finding good ideas. One good idea can change your life, and dozens of good ideas can make you successful on a scale you didn’t dream. Go out of your way to find good ideas! PK: Did you have an interest in working with your father? MP: That’s an interesting question because the answer is so at odds with what it would be in 2015. My father was born in 1897, and I think the idea of having a daughter work in the business simply never occurred to him. For that matter, it didn’t occur to me. I don’t think it ever occurred to him to even encourage me to be a businesswoman. However, I found that I love business and find it intellectually challenging and highly enjoyable. But I found out this on my own, not because of parental encouragement. PK: How did you feel about the sale of Sheraton? MP: I would have loved for it to have stayed a family business, but even though I was a significant stockholder, the decision was never discussed with me. Back in the 1960s, I don’t think it occurred to my brothers to talk about it with me. That’s what the 1960s were like! I don’t resent it, because this was simply the way the world was back then, but I can’t tell you how glad I am that things have changed! PK: You are an entrepreneur yourself, tell us about that. MP: When I came into an inheritance, I was living in Davis, CA, which is an agricultural area. I thought it would be more interesting ­—and more fun– to invest in agricultural land than just to put all my inheritance in the stock market. I spent four years auditing courses at the local university, studying such things as rural appraisal, agricultural economics, agricultural accounting, agronomy and so on. Then I studied more than 30 farms that were for sale and finally settled on one that seemed extraordinarily underpriced, if you were to think in terms of 20 years. It was flat, irrigated land between the City of Sacramento and the airport, and it was bounded by Interstate highways 5, 80, and 880. It seemed like the world’s most perfect candidate for development and yet it was for sale at its agricultural value. However, there was a problem with the land: it was jointly owned by 28 individuals and while most of them wanted to sell, some didn’t. The title problems meant that nobody was bidding against me, and by being willing to wait almost a year for the title problems to clear, I was able to get the land at roughly 2/3rds what it would have cost without the title complications. As time went by and Sacramento grew, the land’s value increased in the way I hoped it would. These and other land deals meant that money I invested and controlled myself has grown at roughly 65 times the rate that the trust that was set up for me has grown. PK: After your marriage to Frank Perdue, tell us about your involvement in his business. MP: My role in the business was intense, but it was limited to a very narrow part of it. Frank once told me (and I wrote it in my diary) that one of the most important jobs of a leader is the culture he or she creates. Frank wanted to reinforce a culture that involves appreciation. I thought one way of helping with the culture he wanted was to entertain, in our home, every person who worked for Perdue. For 17 years, we’d have groups of 100 associates several times a month come for dinner. At these parties Frank would often stand behind the buffet line and serve his employees, and at the end of the party, he’d thank them, telling them that he knew that the company wouldn’t be what it is today without each of them. By the way, entertaining thousands of people suited me perfectly because I adore entertaining. Coming from the hospitality industry, I loved the chance to meet Perdue associates and to welcome them to our home. Honest, I wish I were still entertaining on this scale. I really loved doing it and I know Frank appreciated it. So, I think the most important thing I did for the company was I created a platform for Frank to help reinforce the culture of ***appreciation*** that he wanted. PK: Your son from a prior marriage is working with Frank’s children. How is that working out? MP: One of the things I’m proudest of in life is how the two families blended. Two years after Frank’s death, his son Jim appointed my son Carlos Ayala to be Vice President for International. How many step-brothers get along that well? It meant much more to me that Jim promoted Carlos to that position than if Frank had done it. And my son Zé, who is Ph.D. geneticist doesn’t work in the company but he’s totally involved in the family. He’s in charge of this year’s family vacation, which will involve 50 people. He’s close enough with other family members that I believe that a week doesn’t go by without his talking with several family members. PK: How does the leading generation manage positions, roles and compensation? MP: Family members who apply for a job are entitled to a job, but if they don’t perform, they are not going to keep the job. There’s a major effort to treat family members the same way as non-family members. They have to earn whatever positions they get. PK: How has the family managed to set the stage for cohesion? MP: Frank didn’t leave this to accident. He put a tremendous amount of effort into laying the foundation for keeping the family business as a family business. Here are some of the things he and I did together to encourage family harmony. They’re also things that I’d recommend to any family business. 1. Have a family vacation at least every 18 months. In a geographically dispersed family, having the cousins spend time together and play together can mean building friendship and trust that only happen when they spend time together. 2. Arrange to subsidize your family vacation even after you’re gone. Families are in danger of drifting apart after the patriarch is gone. An endowed family vacation can counteract this tendency. Not only the vacation itself, but also the planning for it and the memories of it are a powerful force for keeping future generations together. 3. Make the vacation appealing to those with young children. To encourage everyone to attend, include in the budget the funds needed for baby sitters and also be sure to include child-friendly activities. 4. Write a monthly family newsletter. Initially, our newsletter consisted of my interviewing Frank about the values and the family history that he wanted to share with younger family members. Over time, the newsletter grew to include descriptions of engagements, weddings, and interviews with prospective new family members whenever there was an engagement, so we could all get to know the new family member. There are also many articles on how family members are doing in their careers. The fruits of having a newsletter is it strengthens the family culture of who we are and how we do things. 5. Have a family album each year. Ours is a hardcover book made using Apple’s Aperture software. In ours, I try to have a photograph of each member and a caption on what the individual is up to. My favorite theme, although I don’t do it every year, is to have “the family question.” This changes from year to year, but one year it might be, “Who is the person you most admire, and why?” Another year it’s, “What is your earliest memory,” and still another is, “Magic, magic, there are two extra hours in every day. How would you spend the extra time?” The answers to the family question are often surprising, and we end up knowing more about each other this way. It’s bonding. 6. Have traditions. There’s a saying that I treasure: “Tradition is the lifeblood of identity.” In ours, we have the same recipes year after year at Thanksgiving and we all know which dish we’re bringing and we all know which one of us is going to say the blessing. What traditions can you nurture? 7. Have an education committee. Planning to keep the family educated and abreast of what’s going on in the business world can be a tremendously bonding experience. It gets people focused on a common goal, and it’s apt to start many conversations about what is important for the family. 8. Decide what educational topics most interest the family. I did an Internet search on various family business sites and found that the five topics that came up most often on what families would like more education on are: How the family business works; Governance (as in, how do we make decisions in a way that promotes harmony); Financial literacy; Wealth literacy; and lot of families want education on philanthropy. Adjust the topics according to what you believe would most interest your family and then ask your family members to rank them. Have them vote on it, so they own the choice, as opposed to its having been imposed by you. 9. Arrange ways of carrying out the family’s educational objectives. Our committee has three educational activities a year; we select a book for everyone to read and discuss during the family vacation; we have a webinar where we pay for an outside speaker so family members can participate while we’re geographically separated; and an inspirational speaker at the annual stockholder meeting. 10. Hire family business experts to fine-tune your family cohesion efforts. 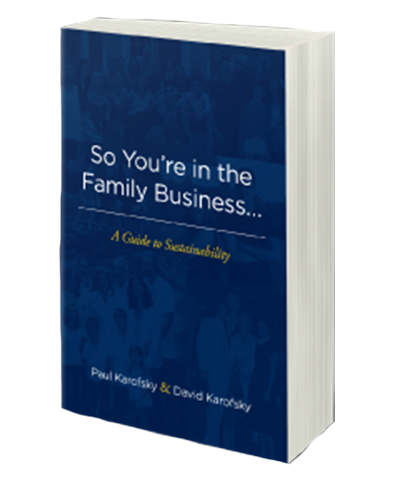 The field of family business experts and consultants is growing and there are abundant quality resources available. We are fortunate to make use of them to help us build and sustain family harmony. Nurturing it has been a wise investment.